Loxit’s protective projector case for the swing away projector wall boom is a wall mounted protective box. 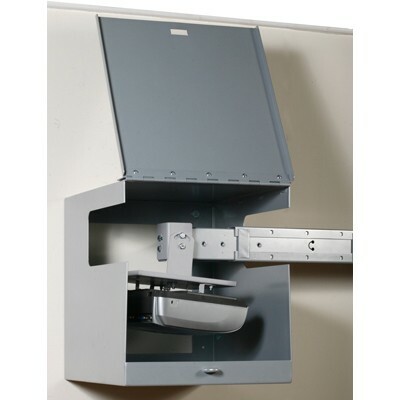 The top hinged door allows the boom to enter from the left or right hand side. Kit includes security case and padlock, does not include fixings. The swing away projector case provides effective protection to the wall mounted projector. When the projector is no longer in use, it can be swung away and secured using a padlock. Cut outs to both sides of the case allow users to place to either the left or right hand side of the projector boom. High quality piano hinge provides reliable high strength hinging to door. 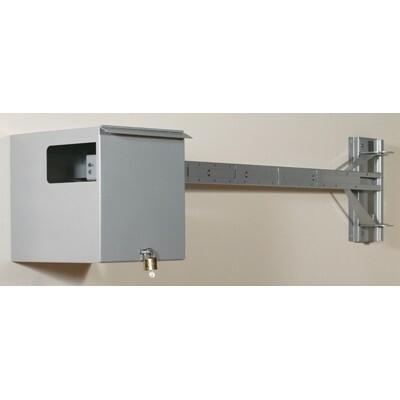 Internal dimensions of wall mounted swing away projector case 400mm wide x 470mm deep x 450mm high. For use in areas where the projector is not required to be set-up permanently and it is required to be protected when stored. i.e. a sports hall or assembly hall, churches etc.